These 60's era digest-sized paperbacks are interesting cultural artifacts for two reasons. 1.) They feature homosexual themes. 2.) The cover paintings are by fetish artist Gene Bilbrew. 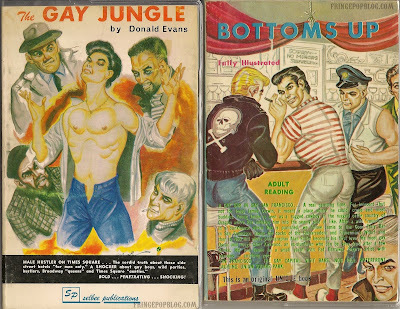 Gay pulps are fun collectibles in and of themselves. Now, adding the delightful art of Gene Bilbrew (aka "Eneg") just makes them all the better. Bilbrew is a little known artist to the mainstream, but to fetish art connoisseurs and 60's sleaze paperback collectors, he is an icon. So, enjoy these two gems of sleaze paperback history. They aren't making more of them.